Trip Lee - "Beautiful Life"
This is a story that people don't know enough about. It's a story that has been denied its share of national news coverage. It's a story that flies in the face of the pro-abortion stance, typically supported by the national news media outlets. If you're in the dark on this whole situation, please take the 22 minutes it takes to view 3801 Lancaster, an account of the Philadelphia Women's Medical Society, the abortion clinic ran by Dr. Kermit Gosnell. Women's lives were in danger (and some were lost) due to the practices of this man. But a greater point to ponder is our stance on life in general. It's becoming alarming how cheaply we view life itself. This morning, an article on The Atlantic (a national news magazine) website reveals that the author hadn't heard about this case until last week, let alone the acts of Mr. Gosnell. A search of the New York Times homepage and CNN homepage yielded no immediate results. A further search of CNN.com yielded 31 total results, mostly from blogs, which are not normally included on the front page of CNN.com. Only three articles have been featured on CNN.com in 2013 regarding Kermit Gosnell. Those were from March 4th. Before that, the other articles from 2011. It is further evidence of the tragic lack of coverage this story, and forget about the trial; has received. 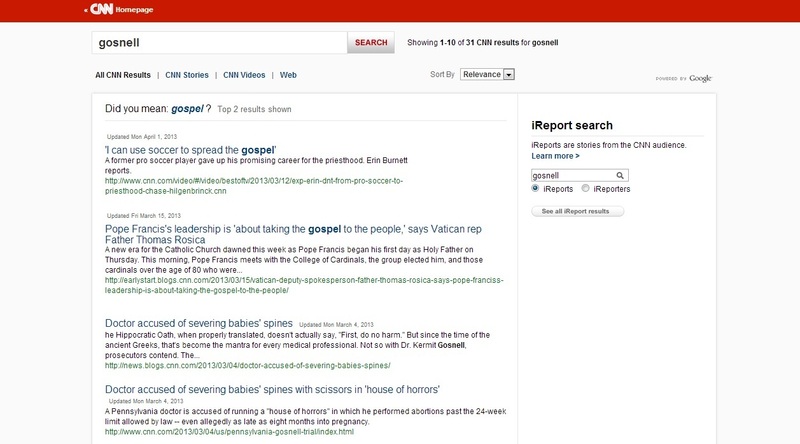 As a side note, I find it particularly interesting that CNN's search engine questioned whether I was searching for the term "gospel", as opposed to "Gosnell". The association of the two terms in a search engine is somewhat tragic, yet a reminder that even though we may be righteously vexed by Mr. Gosnell's murders, we also love him and know that Jesus saved repentant murderers who trust Jesus (Credit - Burk Parsons) Russell Moore shares the almost exact experience upon his search of Mr. Gosnell's name in his smartphone. Mr. #Gosnell, we're righteously vexed by your murders, but we also love you and know that Jesus saves repentant murderers who trust Jesus. Typically, people do not associate rap or hip-hop music with the discussion of weighty, moral and biblical viewpoints. But with the call to greater attention of this trial, I was reminded of a song from Trip Lee entitled "Beautiful Life". It's a account of a young woman struggling with the question of abortion, and the inconvenient timing of a child due to an unplanned pregnancy. Trip follows with a verse dedicated to the male in the relationship, who was most likely "caught off guard" by a pregnancy. Finally, as poetically as possible, Trip links the struggles of abortion, especially the guilt of those with that have already had an abortion performed, to the gospel and forgiveness found in Christ. That third verse is about as good as anyone could explain the freedom that exists in Christ, even for sinners like us, and Mr. Gosnell.